Technical Differences between L-Band BUCs or 70 MHz Transceivers. We began installing VSATs for clients in 2000 and always installed a 70 MHz modem with an Anacom or Codan transceiver. As the years passed we sold fewer and fewer transceivers and more and more BUCs, so lets take a look at the difference between the two. The VSAT installation has the antenna mounted outside with the transceiver mounted as close to the antenna feed as possible. The modem and other electronics are connected by cable between the operations center and the antenna. If this cable was required to carry the broadcast frequency of 4 to 6 GHz it would need to be thick and very expensive. In order to cut down costs satellite engineers devised a system where the modem could communicate with the transceiver using lower frequencies. They called this lower frequency “Intermediate Frequency (IF)“. Intermediate frequencies can be carried over long distances between the antenna and indoor equipment using cheap cables. To illustrate the difference between the two technologies let us first review the 70 MHz modem and transceiver combination, using C-Band as my example, but apart from the frequency range everything remains true for KU band as well. The receive frequency of 4 GHz is collected by the antenna and fed to an LNA and then passed to the receive port of the transceiver. Typically the transceiver is mounted on the antenna and so only a short length of thick cable is required between the LNA and the transceiver. Once the signal gets to the transceiver it is converted from high frequency to an Intermediate Frequency (IF) of 70 MHz and then carried by standard Coax cable the long distances from the antenna to the indoor equipment. Detailed VSAT technical information for Engineers. The transceiver contains all the frequency conversion and input/output power controls that are needed to send and receive a satellite signal. The transceiver must be waterproof and impervious to heat and cold. 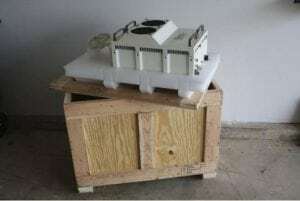 All of these features add to the purchase price of the transceiver, which is typically comprised of a power supply, an SSPA, an up converter and a down converter. In the early 2000’s in an effort to reduce the price of the transceiver, a new scheme was developed that used a higher Intermediate frequency in the 900 to 1500MHz range. Even though much higher than 70MHz, this L-Band frequency, as it was named, can still be carried long distances over cheap cable. The other change was to replace the transceiver with a much simpler and cheaper unit called a Block Up Converter or BUC. The BUC makes a low frequency to high frequency conversion and then acts as an amplifier sending the signal up to the satellite. The early BUCs were dumb device compared to transceivers but today BUCs are becoming more sophisticated, some of the newer one can be controlled using a smart phone app. The BUC power supply, transmit power settings and frequency selections are now moved into the L-Band modem. The modem sits indoors and does not require the same environmental protection as the BUC. The penalty is that the L-Band modem now costs more than a similar 70 MHz modem. Even so, the cost of the combination BUC, LNB and L-Band modem is many thousands of dollars less than the cost of the older transceiver system. A new C-Band Transceiver will cost $12,000 and above, with a matching satellite modem costing $3000 or more. 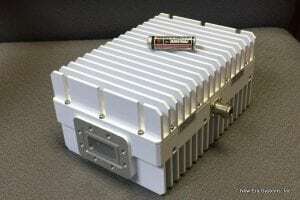 A typical 20W C-Band BUC will cost $4500 with the L-Band modem costing $4250, at the other end of the scale a 5 watt BUC can cost less than $750 compared with the price of an Anacom 5 watt transceiver at $9663. As the sales of BUCs continue to increase the manufacturers are decreasing the prices for their C-Band and KU band BUCs.Prices for a KU BUCs are slightly different than for C-Band, but the same ratio of price savings can be expected. The used equipment market is a good source for even better savings, although transceivers are becoming increasingly difficult to find as BUCs become the new standard.